Passenger Turboprop Crashes In Laos; All 49 On Board Feared Dead : The Two-Way The plane reportedly went into the Mekong River on approach to an airport in the southern city of Pakse. 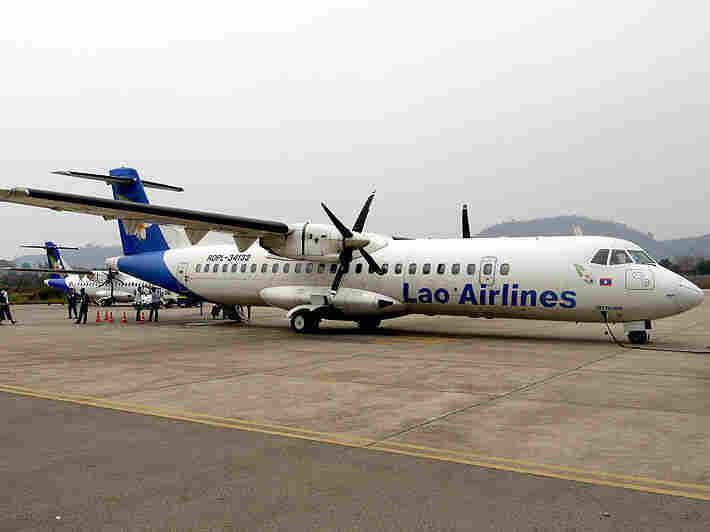 A Lao Airlines ATR similar to the one that crashed on Wednesday. A Lao Airlines flight from the capital, Vientiane, crashed into the Mekong River as it was landing. There was no word of survivors among the 49 passengers and crew, The Bangkok Post reports. The twin-turbo ATR, with 44 passengers and five crew on board, hit the water short of a runway in Pakse, in Champassak province in southern Laos, the newspaper says. Witnesses quoted by the Post said they saw dead bodies at a makeshift emergency ward set up at a Buddhist temple near the crash site. "Upon preparing to land at Pakse airport the aircraft ran into extreme bad weather conditions and was reportedly crashed into the Mekong River. There were no news of survivors at this time," the statement said. "Lao Airlines is taking all necessary steps to coordinate and dispatch all rescue units to the accident site in the hope of finding survivors and at the same time informing relatives of the passengers," it added. The Associated Press quotes a Thai Foreign Ministry spokesman as saying everyone aboard — including five Thai nationals — were killed in the crash. Spokesman Sek Wannamethee said "the flight from the Lao capital of Vientiane to Pakse in southern Laos crashed at about 4 p.m. Lao time [5:30 a.m. ET]." "He said the flight crashed 7-8 kilometers [4-5 miles] short of the international airport at Pakse. Reports by China's official Xinhua News Agency and Thai media said the plane crashed in the Mekong River."